Mundelein Community Connection (MCC) is a not for profit organization dedicated to the economic development, historic preservation and healthy community spirit of Mundelein’s central business district. Working together we provide an atmosphere where new and established businesses can grow and where families find the hometown they always wanted. Formerly known as “Mundelein Main Street,” MCC is made up of community leaders -current and future - enthusiastic business owners, residents and village officials who care deeply about promoting and sustaining Mundelein’s hometown appeal. Thanks to the planning and promotion of many popular family-friendly places and events, today Mundelein enjoys steady retail growth, ongoing streetscape improvements, and a stronger community identity. Would you like to join us? We welcome your ideas and enthusiasm. Get on board the Mundelein Community Connection. A steering committee made up of M.J. Seiler, Debbie Mullen, Lynnea Hansen, Kevin Kristan & Barry Kraemer investigated the National Main Street Center approach that was succeeding in over 1500 communities. The Mundelein revitalization group elected its first 13-person Board of Directors, wrote b-laws and mission statements, and established committees to begin activities. Officially incorporated in July of 1993, the organization called itself "MUNDELEIN PRIDE" to reflect the emotion they hoped to instill in the community through the rebirth of the downtown business district. The Board occupied the then-vacant Lincoln School basement for its office and began laying the groundwork through education and recruitment efforts. Resurrecting a faded community tradition, the Board and dozens of volunteers built and staffed "Santa's Cottage" to serve as an anchor for downtown holiday activities. The Farmer's Market, the Golf Outing, Paint & Plant Exchanges, Family Block Party, Mundelein Pride Week, newsletters, a Facade Loan Pool and many high-profile appearances throughout the next few years earned Mundelein Pride a reputation as an active organization that would make a great difference. The Village of Mundelein enthusiastically supported Mundelein Pride's efforts, with in-kind assistance for activities and financial support through a "Matching Funds" grant that became a cornerstone of the yearly budget. Local banks also pooled cash in the early years to sustain efforts as wider sources of funding grew through membership and sponsorship. Illinois MainStreet began in 1993-1995 in the office of Lt. Governor Bob Kustra, to bring a cohesive approach to revitalizing traditional downtown areas of communities across the state. The program assembled an energetic staff, experts in the Four Points of MainStreet, and professional resources to work with not-for profit groups that would otherwise be left on their own. The diverse network of communities, large and small, proved invaluable to organizations seeking new approaches to solve the common problems of traditional business districts. Illinois MainStreet provided, free to member communities, ongoing Board training, program assessment, statistical tracking, individual guidance, regular educational seminars, access to services of the Illinois Historic Preservation Agency (IHPA), and membership in the National Trust's National MainStreet Center. The state MainStreet Program was housed in the Lt. Governor's office until 1999. Then to stabilize the funding, staff and resources of the program, Illinois MainStreet was moved into the Dept. of Commerce and Community Affairs (DCCA) and due to budget cuts was dissolved in 2002. Staffed entirely by volunteers, and recognizing the need for more coordination and stable management, the Board moved into a storefront office at 16 East Park Street and hired volunteer Judy Weimer to be the Office Manager. But Board members realized they would need a more aggressive plan of action. Mundelein still needed a comprehensive plan and a budget to support a full-time program manager to become an official Illinois MainStreet Community. 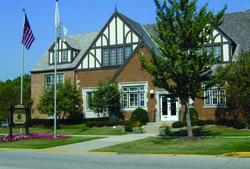 So from 1996-97, the Board committed to growing the budget to accommodate staff as the Village of Mundelein hired the Hitchcock Design Group to draft the Downtown Comprehensive Plan. Thanks to the hard work of Mundelein Pride, the Mayor and Village Board passed resolutions for the long-term support of the Village government. The state application team included the entire Board of Directors, Office Manager Judy Weimer, Village Trustee Ray Semple, Assistant Village Administrator Mike Flynn and Nancy Chmelar, an economic development intern who did much of the statistical research. The application was creatively leather-bound and delivered to a distinguished panel of judges in a presentation at the Lieutenant Governor's office. In January of 1998, Mundelein was one of only four communities to be accepted into the Illinois MainStreet program. Upon acceptance, the Board hired John Maguire, a downtown business owner, original Board Member and lifelong Mundelein resident to become its first full-time Executive Director. Mundelein MainStreet worked with business and property owners to encourage participation and improvements. Promotional events, educational programs, business assistance and MainStreet training became more frequent. To fully capitalize on the affiliation with Illinois MainStreet, the National MainStreet Center and the 1,500-plus other communities in the program, the name of the group was officially changed from Mundelein Pride to "MUNDELEIN MAINSTREET". The revitalization of Mundelein's original business area begins in earnest. A new Metra Rail Station brought commuter service to Mundelein and connected it to other desirable communities. 7 property owners utilized the MainStreet Loan Program to renovate their buildings, and the trend to "dress up" tired buildings spread. Walgreen's and Dunkin' Donuts worked with us to design new facilities to fit into the neighborhood. The Park District began rebuilding Kracklauer Park into a wonderful "central park," with a gazebo/stage as its centerpiece. Mundelein Community Connection is a not for profit 501 (c)(3) corporation whose purpose is to stimulate economic development in Mundelein through Organization - encouraging cooperation and building leadership in the business and residential community; Economic Restructuring - developing and retaining current businesses, and assisting in recruiting new exciting businesses to Mundelein; Promotion - creating a positive image for the downtown and all of Mundelein as an exciting place to live, shop and invest; Design - improving the appearance of the downtown while preserving its historical assets and character; and to receive, administer and distribute funds in connection with activities related to the above purposes. downtown businesses and property owners, and the Village of Mundelein.